I'm a cooking and grilling glove freak. My skin is sensitive, and I'm really careful to use good gloves. So, when Rizzi asked if I'd like to check out Mr. Grill outdoor cooking gloves, I read up on them and decided I'd like to give them a try. She sent me a pair for an honest review (which is the only type I'll do). Kitchen cooks may notice these look a bit like Ove Gloves which I enjoy in the kitchen. My aunt sent me a pair for Christmas several years back. I don't think I've reviewed them, but they are great for indoors. Mr. Grill went with black instead of the beige of indoor kitchen gloves which is good. Outdoor gloves are going to get dirty. A bonus is that these can go in the washing machine. I love my Lodge Grill gloves, but they are leather and look grungy, but I can't wash them. Add a plus to Mr. Grill gloves for being washable. The outer part of the Mr. Grill grilling gloves is made to not catch fire. Your kitchen mitts are not. 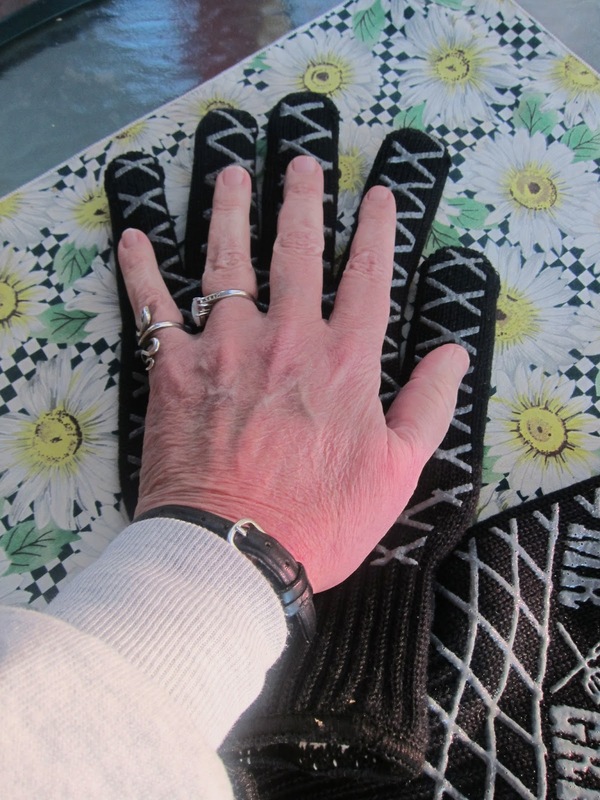 You save money by getting actual grill gloves, because kitchen gloves and mitts will scorch or burn. As far as temperatures, Mr. Grill gloves protect up to 622 degrees. That's a pretty random number, and I did not test for temps. The grill gloves work great for grilling. I have not used a Dutch Oven in quite a while and likely would go with the Lodge gloves, since those temps go really high at times. Most people are not doing DO unless in Boy Scouts, so that's not a real issue here. If you're a backyard griller, you seldom get super hot temps. If you do, you likely know to use heavy duty or fireman outdoor gloves for the real hot jobs. I didn't see a size for the Mr. Grill gloves, so I'm guessing "one size fits all." Here is a photo with my hand against the grill glove. Since I'm female, I should mention that my fingers are as long as most guys. I'd say 9 of 10 guys - my fingers would be the same length. I got my long fingers from my Dad. My fingers are not thick though (ring size is 7 to 7.5 - about average for females). You can see that the Mr. Grill gloves would fit virtually any hand when you consider my finger length. Inside I have around 1/4 extra space at the ends. Perhaps a little more if I had to push. The fingers of the gloves are lined. They slide right on for me, since my fingers are slim. I'd say if you had thicker fingers, you'd have to tug a bit to get in the gloves. For a glove model, I really love Mr. 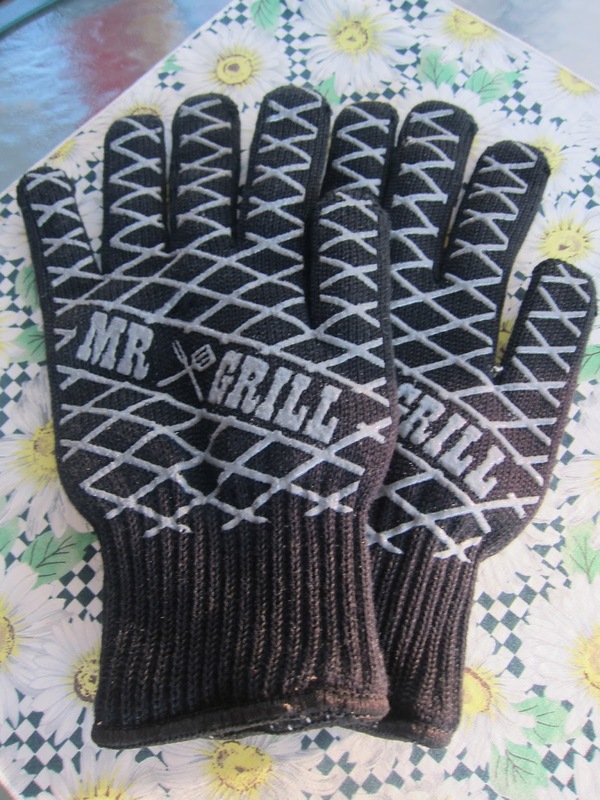 Grill grilling gloves. If I want to get in and out fast, I like the Oxo mitten style. That's usually in the summer and on a quick grill. In colder weather and with a lot to grill, then I'd go with gloves. And, Mr. Grill gloves work great. They come in a pair (and many of the grill gloves and mittens are sold as singles), so the price is quite good as well. I don't sell products, but you can get Mr. Grill gloves at Amazon. Just put the name in search. They are very well made, and I was impressed with them. I think you will be too.